>Joel is the co-founder of the Annual Lynn Invitational Baseball Showcase Tournament Since its inception in 2005. 30 MLB draft picks, 9 major leaguers, 4 free Agent MLB signings in past 7 years. 1. Major league All- Star in 2013 game. Additionally Joel was the founder of a very successful AAU program (Mass Magic) 3 place finish >2003 AAU Nationals Florida. Joel is also a former high school player at (St Mary's HS Lynn MA) and in the St. Mary’s Varsity Club Hall of Fame. Joel Assists as American Legion baseball coach and consultant with the Prestigious Post 6 in Lynn Ma since 2005. >Joel works as a hitting consultant and as clinician for dozens of New England Universities and Colleges and Professional Baseball players and has assisted over two hundred student athletes into Colleges and Universities across the Country. >Lead baseball camp Instructor and coordinator in Puerto Rico, Dominican Republic 2009-present. 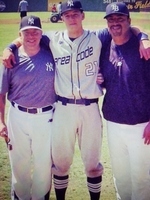 >NY Yankees 2014 Area Code Advisory Team and Coach Long Beach CA. Coordinate and function as a liaison between player and coach and instruct players in all capacities who thrive to be the best they can be. Working directly with the coaches and players to evaluate and make a difference in each and every players lives. Follow progress on players and scout day to day operations of the fledgling league. An honor to work with both Independent Pros as well as affiliated players getting in gear for up coming spring training. >Joel is happily married to his wife Carissa of 17 years. Joel and Carissa have a Son, Caleb, and a dauhther, Kayla.